In his new young-adult book, "The President Has Been Shot! 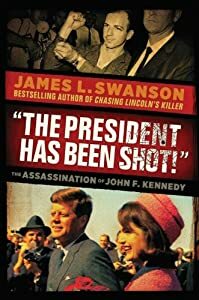 ": The Assassination of John F. Kennedy, James Swanson will transport readers back to one of the most shocking, sad, and terrifying events in American history. As he did in his bestselling Scholastic YA book, Chasing Lincoln's Killer , Swanson will deploy his signature "you are there" style -- a riveting, ticking-clock pace, with an unprecedented eye for dramatic details and impeccable historical accuracy -- to tell the story of the JFK assassination as it has never been told before. James L. Swanson has written for a variety of publications, including the WALL STREET JOURNAL and the LOS ANGELES TIMES. He is the coauthor of Lincoln's Assassins: Their Trial and Execution , and he is a member of the advisory committee of the Abraham Lincoln Bicentennial Commission. Mr. Swanson is an attorney and has held a number of government and think-tank posts in Washington, DC. MY daughter has been intrigued with this President and everything that surrounds his life and death. I cannot exactly say what it was that has drawn her to this President, but she was and thus this book was one that she was excited to read. As a history buff myself I too was intrigued and so we decided to read this together. Let me tell you, the author did a great job at pulling together a ton of facts, images, documents and more to share the story of the assassination of President Kennedy. The book was suspenseful and kept my daughter engaged form beginning to end. Throughout the book my daughter kept asking me to read one more page, which is what I am always hoping for when reading with her. If you too are a history fan, and love to learn more about the U.S. Presidents, this is definitely a book that you will want to read!